Imagine for a moment being a 16 year-old student at a summer program for intellectually curious teens — surrounded by some of the most interesting international peers you could hope to meet. 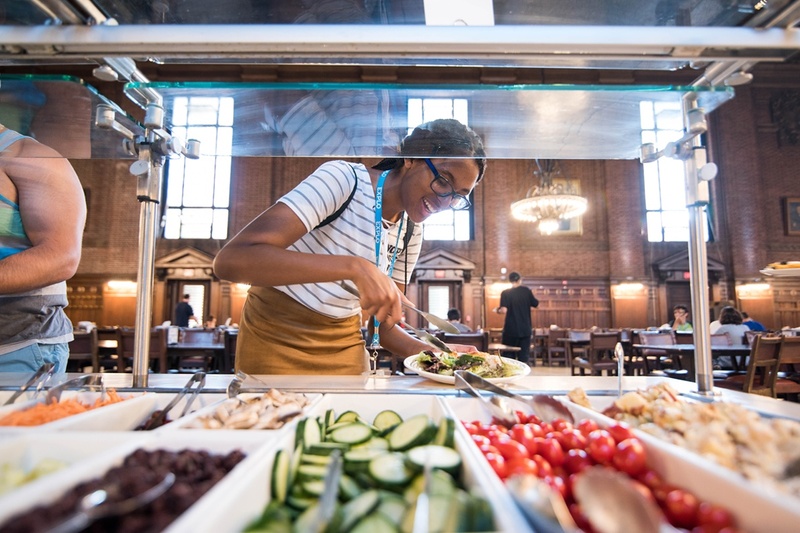 At lunchtime, you approach the salad bar, and along with the healthy serving of hearty greens, colorful veggies, and an assortment of proteins, is a whopping side of choice paralysis. So, how do you make a salad? Whip out your cell phone, call home, and ask mom what you should put in your bowl. Then proceed to describe every option, negotiate its value to the palate, and effectively hold up the entire line of 300+ people looking to get their chef salad on. This was an actual scene from one of our summer programs this past year. And it sparked a major conversation across our organization about one of the major challenges facing kids today: choice paralysis. Given too many options and, in many cases, limited practice making decisions, young people increasingly find themselves ill-equipped to make even basic choices (like what goes in the salad bowl), let alone meaningful or life-impacting ones (like what college is best for me). Perhaps more precisely, the conversation around the Exploration Center percolates on the Paradox of Choice, a term coined by psychologist and Swarthmore College professor Barry Schwartz in 2004. Schwartz was one of the first social scientists to publish a thesis in direct contradiction to the commonly-held (and, according to him, absolutely logical) belief that the more choices people have, the better off we are. But emerging consumer research in the early aughts (including Iyengar and Lepper’s landmark Jam Experiment) indicated that, when faced with too many choices, people are far less likely to make a purchase. Given too many options and, in many cases, limited practice making decisions, young people increasingly find themselves ill equipped to make even basic choices. Too many options — or a lack of practice making choices? Here at EXPLO, we tend to agree that options for the sake of having options isn’t meaningful. And, to be clear, Schwartz et al’s research is squarely set in consumerism — we’re not equating the decision to purchase jam with the ability to decide between the best college and the college that is best for you. But as a summer program that touts hundreds of courses, workshops, trips, and activities as a hallmark feature, we do have to be reflective of the reasons why we’re offering so much choice. At EXPLO, everything we do is centered around the concept of agency — that all of our students have the capacity to make choices about what they will explore, who they will engage with, what trips and activities they will attend, what they will eat. But making choices and taking ownership and responsibility for them is learned through experience. Beyond struggling to make a decision, young people today struggle to walk through the process of weighing their options without extreme anxiety. When young people are not offered the opportunity to practice making choices, they don’t develop the sense of agency that allows them to navigate situations of uncertainty or to plan for a future that will fulfill them. And, by all accounts, whatever they choose to pursue in college or career, that future is going to be rife with volatility, uncertainty, complexity, and ambiguity. We also know that, beyond struggling to make a decision, young people today struggle to walk through the process of weighing their options without extreme anxiety. Forget the salad bar. By the time they get to college and have to choose what courses to take, what to major in, what activities and student groups they’ll join, it’s like drinking from a fire hose — they simply can’t do it. They are too overwhelmed and have no experience to fall back on. EXPLO is that experience. Over four decades, we’ve found that the more students are asked to make choices (and the more practice they get), the more prepared they are to join new communities, actively seek new friendships, cultivate an entrepreneurial mindset, and develop a sense of purpose. And isn’t that what we all really want for our kids? Put your child in a position where they have to make decisions. Don't offer a safety net (or at least not one that is visible), and let them struggle a bit. It's good. It's how they grow! Coach them through the decision-making process. Allowing space for kids to practice making meaningful choices for themselves doesn’t mean extracting yourself from the process entirely. Of course they need guidance! Contextualize the size of the choice with them, help them list the pros and cons of each choice, and (when age-appropriate) let them see you work through making some choices. An environment built for exploration will do far more for your child than an environment built for achievement. It’s hard to practice making the choices that feel right for you when you are living and learning under the pressure of grades and predetermined standards for success. Most schools are achievement-based, so summer is a perfect time to encourage your kids to step out of their comfort zone, try new things, and pursue their strengths and interests without fear of failure. Practice may make perfect, but failure makes progress. It’s antithetical to every instinct we have as parents, but it’s important to allow our kids to fail sometimes. We learn to make better decisions when we have to correct decisions that weren’t so great. When our kids have to navigate a tough choice, experience bumps in the road, and redirect their course based on what they’ve learned from the unsuccessful experience, they’ll gain confidence and be more prepared to face down a similar challenge down the road.